Had The Visitation of Saint Anne by Ghirlandaio, panel painting. cadogan p244. Also two by Francesco Morandini (il Poppi ) - a Crucifixion and a Finding of the True Cross, both now in the Andrea del Sarto Cenacolo Museum at San Salvi. Where there is also a Gloria di angeli e santi by Giovanni Baldacci. The Widows' Asylum of Santa Maria in Orbatello was founded in 1372 by Nicholas Alberti and designed, we are told, by Agnolo Gaddi. It was set up to house widows and their children, the numbers of whom were a consequence of Florentine society's tendency to marry young women to older men. Construction was completed by 1378. Upon reaching the age of 36 girls from the Spedale degli Innocenti were sent here too. The oratory of Santa Maria di Orbatello is now the art history library of the University of Florence, the old hospital buildings houses a dermatology clinic. An aisleless single nave with a slightly raised presbytery and a trussed wood ceiling with painted decoration. An Adoration of the Magi by Ghirlandaio, now in the Pitti, where it was by 1839. An Annunciation with Saints Nicholas and Anthony Abbot by Giovanni del Biondo is now in the museum of the Ospedale degli Innocenti, as is a triptych of the Madonna and Child with Saints Jerome and Catherine (c.1420) by Giovanni Toscani. Also there is a fresco panel of the Madonna and Child with Two Seraphs by a follower of Ghirlandaio, probably his brother Davide. It is surrounded by panels showing Christ Blessing with Cherubim and Seraphim and Saints Andrew and Denis, by the Master of the Fiesole Epiphany. 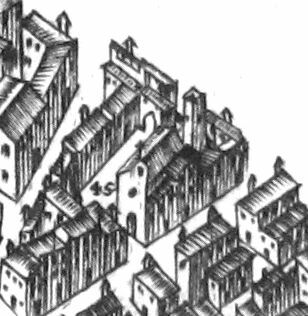 A smaller offshoot of the Camaldolese convent of Santa Maria degli Angeli, established by seven monks from there, including two members of the Ricci family, possibly partially in opposition to the dominant Albizzi faction. The complex was built on land bought by Don Alessandro dei Ricci just outside the third set of city walls, with help from other donors from the Spini family. The plague of 1400 had left Don Alessandro as the sole heir to the family's estate and the church was built by 1402. Inside the church the chapel of St Luke had frescoes and a gold-ground altarpiece. 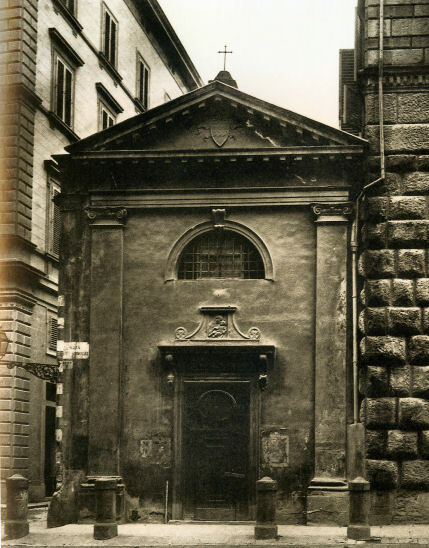 The chapel of St Anthony was added in 1402, funded by the Corso as a private burial space. A campanile and library followed in 1405, the church was consecrated in 1407 and choir stalls and Lorenzo Monaco's Coronation of the Virgin (see right) were installed in 1409. A new cloister followed in 1412. The complex was demolished during the Siege of Florence in 1529/30. Its treasures were moved to Santa Maria degli Angeli, including manuscripts, as well as the altarpieces mentioned below, the Lorenzo Monaco one being moved to the Alberti Chapel in the cloister there, where Vasari saw it. Lorenzo Monaco's Coronation of the Virgin (1407),now in the National Gallery, once stood on the high altar here. This commission presumably not unconnected with his having been a monk at Santa Maria degli Angeli, the monastery from which this community sprang. Predella panels depicting the Adoration of the Magi and Scenes from life St Benedict are in the National Gallery, the Vatican Pinacoteca and the National Museum in Poznań in Poland. Pinnacle panels depicting the Virgin Annunciate, the Prophet Jeremiah and the Blessing Redeemer are in Pasadena, the Feigen Collection and the Accademia. The Four Patriarchs, now in the Met in New York, are more disputed additions. An altarpiece of 1404 of the Virgin and Child with Saints by Niccolò di Pietro Gerini is now in the Accademia. The predella depicting scenes from the lives of Saints Lawrence, John the Baptist and Anthony Abbot and a central Adoration of the Magi are in the Feigen Collection, a private collection, Zagreb and the Berlin Gemäldegalerie respectively. This altarpiece was part of an endowment by Domenico di Francesco Corsi, a silk merchant, for the chapel of St Anthony Abbot here. This Augustinian complex, just outside the Porta Romana, was demolished during the siege of Florence in 1529-1530, as were most buildings outside the walls, so that the attackers couldn't use them for refuge or supplies. The Romanesque portico of this church, possibly 11th-century, is now on the front of San Jacopo sopr'Arno. Leonardo's dramatically unfinished and Flemish-influenced Adoration of the Magi, commissioned in 1481 is now in the Uffizi, as is the less animated but still well-populated panel (finished in March 1496) that the brothers here got Filippino Lippi to paint on the same subject to replace it. It is not known why Leonardo's altarpiece went uncompleted - one theory is that the composition for too unusual for the monks - or why a commission to Ghirlandaio, before Lippi got the job, proved similarly fruitless. The Leonardo panel underwent a 6-year restoration that was completed in 2017. Had a large painted Crucifix by Bernardo Daddi, now in the Accademia, and a Last Supper in the refectory by Ghirlandaio. The detached fresco fragment of The Madonna del Parto by Taddeo Gaddi (c. 1355) now in San Francesco di Paola, was taken from the demolished church of San Pier Maggiore, but it is said to have originally come from this church. Two panels from a polyptych, Saints Catherine of Alexandria and Caius, of about 1390 by Lorenzo Monaco, his first major commission, are now in the Accademia. The pinnacle with The Coronation of the Virgin is in the Courtauld, with predella panels in Berlin (but not to be found in the Gemäldegalerie when I was there) and Santa Barbara. A church dedicated to hermit monk Saint Gallen had existed here since 1218. In the 15th century the church passed from Franciscans to the reformed Augustinians at the instigation of Lorenzo de 'Medici who got the architect Giuliano Giamberti to expand the church and monastery. Work on the new building was underway by 1488 and reported as 'almost finished' in 1493. This work so impressed Lorenzo that he, as reported by Giorgio Vasari, nicknamed the architect Sangallo, and thereafter his Giamberti descendants kept the name da Sangallo. This was the one major ecclesiastical commission that Lorenzo financed himself. 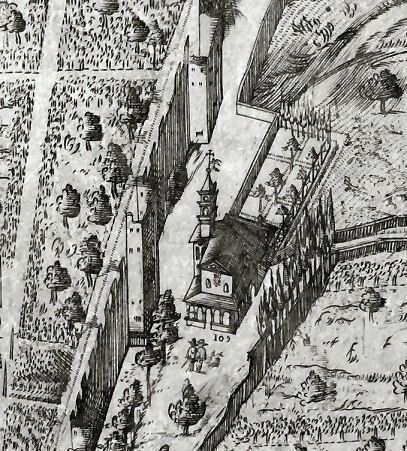 The complex was demolished during the siege of Florence in 1529-1530, as were most buildings outside the walls, so that the attackers couldn't use them for refuge or supplies. An early 14th Century inventory lists a 'little old church with an altar and a sacristy next to the said church and a bell tower with four large bells' and 'another new church near to the old church with the piazza in between. 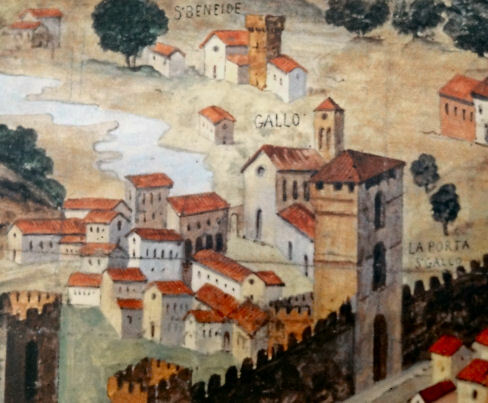 In the detail from the Catena map of 1471-80 (see right) the old church must be the building to the right, under the word GALLO, with the new church's portico, it is presumed, to the left. Fra Bartolomeo's Lamentation was painted for San Gallo, moved to San Jacopo tra Fossi, and is now in the Palatine Gallery in the Palazzo Pitti. The Noli me Tangere by Andrea del Sarto (see right), is one of three altarpieces that he painted around 1510 for San Gallo. It too was moved to San Jacopo tra Fossi, and is now in the museum in the refectory at San Salvi, which also houses Andrea's famous Cenacollo. The other two were a Disputation on the Trinity (widely thought by his contemporaries to be one of his masterpieces) and an impressive and architectural Annunciation, with the angel unusually on the right, both now in the Pitti. The Annunciation, having been initially commissioned by Taddeo di Dante da Castiglione for San Gallo, moved to another chapel belonging to the same family in San Jacopo tra Fossi, before Maria Magdalena of Austria had it brought to decorate her bedchamber at the Pitti in 1627. The Madonna and Child with Saints Francis and Zenobius (1510) by Francesco Granacci (see left) from the Gerolami chapel here, is now in the Accademia, where this prolific artist, the son of a mattress maker, apprentice to Ghirlandaio and friend of Michelangelo, has quite a few works in the early rooms. 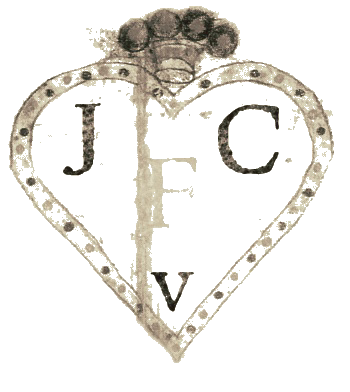 Founded by the Vallombrosan nun Umiltà of Faenza. The complex was demolished during the siege of Florence in 1529-1530, as were most buildings outside the walls, so that the besiegers couldn't use them for refuge or supplies. Much of its surviving art depicts Umiltà with a weasel, the enemy of the serpent, symbol of evil. This animal was replaced as her attribute in later art by a book, and that too vanished in Counter-Reformation depictions of Umiltà, in which she becomes a generic saint without distinguishing symbols (On the Chain Map and mentioned by Vasari re Buffalmacco. This Jesuit monastery was just outside the Porta a Pinti, a northern gate. It had two cloisters frescoed by Perugino and was demolished during the siege of Florence in 1529-1530, as were most buildings outside the walls, so that the attackers couldn't use them for refuge or supplies. Perugino's calm Pietà and his The Agony in the Garden were painted c. 1493-96 for chapels in the rood screen of this church. The Pietà is notable for its lavish use of expensive ultramarine, a pigment which the prior here was said to have been skilled at preparing. Following demolition both were taken to San Giovannino della Calza near the Porta Romana, but have ended up in the Ufizzi. In the area now occupied by the central Post Office, the church was demolished in 1785. Tradition has it that Saint Zenobius, Florence's first bishop, had founded a church here in the 5th Century. The first documented mention of the complex, though, is of a Benedictine convent, founded in 1067, with Ghisla Firidoli as its first abbess. The abbess traditionally welcomed each new bishop of Florence upon his arrival in the city, with a ceremony involving putting a ring on his finger. She was therefore nicknamed 'the wife of the bishop'. The Gothic church was built during enlargement in the early 14th Century, being completed by 1352. It was a large triple-aisled church with the high altar (upon which would have stood the large altarpiece by Jacopo di Cione mentioned below) in a large raised choir chapel that was rebuilt 1612-15, around which time the altarpiece was removed. 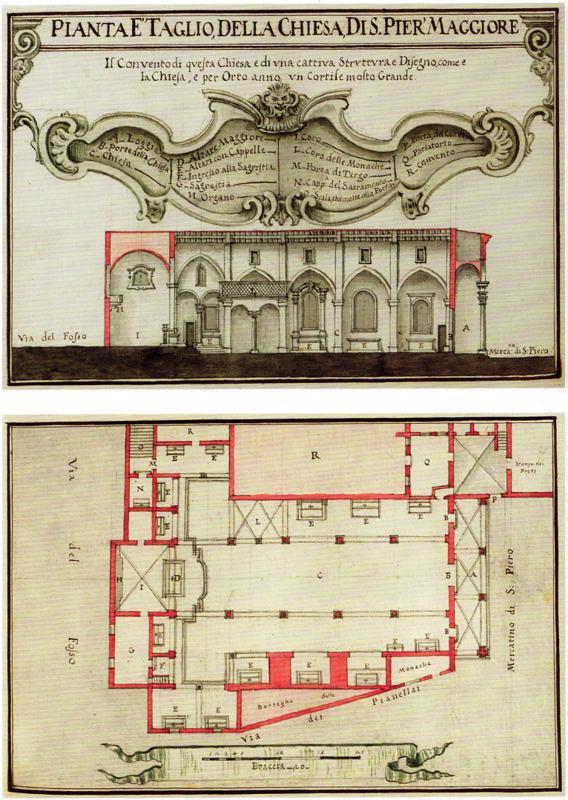 After many minor rebuildings it was rebuilt in 1638 by Matthew Nigetti as seen in the etching (below left) and plan (left). Among the artists buried here were Lorenzo di Credi, Luca della Robbia, Piero di Cosimo and Mariotto Albertinelli. The church was demolished in 1784 having been declared unsafe following a partial collapse during rebuilding work the year before, which had itself been prompted by a crumbling column, but only one, non-load bearing, column had collapsed. Supposedly the real reason for the demolition was Grand Duke Peter Leopold's desire to minimize the dominance of religious institutions in Florence which had been behind so many suppressions. Three arches of the portico (part of the 1638 rebuilding) of the façade survive (see below left), two being occupied by private houses. Art and fittings from the church were transferred to various Florentine institutions, including the Hospital of the Innocents and the church of San Michele Visdomini. An early 14th century painted Crucifix by Lippo di Benivieni is now in the Santa Croce museum, where it's been since 1785. The Assumption of the Virgin by Francesco Botticini, which served as the altarpiece in the burial chapel here of Matteo Palmieri, a civil servant, is now in the National Gallery in London. It was previously thought to be by Botticelli, due to Vasari confusing their names. The Madonna of the Girdle by Francesco Granacci (1508/9) looks very Michelangelo-inspired and is now in the Accademia. The Visitation by Maso da San Friano, a Mannerist altarpiece of 1560 painted for the chapel of the de' Pesci in this church, is now in the Fitzwilliam in Cambridge UK. St Zenobius, the first bishop of Florence, performed one of his miracles on a procession from San Pier Maggiore to the Duomo so the church appears in the background of many paintings of this miracle. The original church is visible in the background of St Zenobius Raising a Boy from the Dead (see below right) by Ridolfo Ghirlandaio. And A Miracle of St Zenobius by Domenico Veneziano in the Fitzwilliam, Cambridge UK, part of the St Lucy Altarpiece. Also Saint Zenobius Resuscitating a Dead Child by Benozzo Gozzoli in the MET New York. The church in Masaccio and Masolino's Saint Peter Healing with His Shadow fresco in the Brancacci Chapel may also be, somewhat appropriately, San Pier Maggiore. 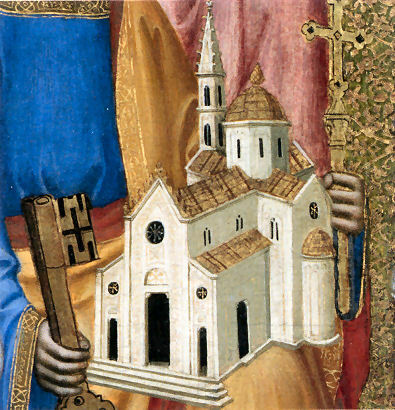 St Peter in the Jacopo di Cione altarpiece. The church and convent was founded in 1417, the first nunnery founded by the Observant Dominicans, who were keen to return to the order's original values. The complex, dedicated to one of the order's most illustrious preachers, benefited from the patronage of Niccolò da Uzzano and was built in the former palace of Niccolò Buondelmonte. Most of the original nuns had come from San Domenico in Pisa, the same house that had helped set up, and remained closely connected with, the Observant Dominican Corpus Domini in Venice. 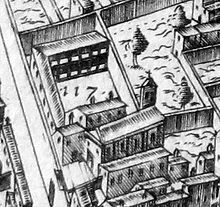 In 1557 the monastery was closed and demolished to make room for the fortifications around the San Pier Gattolino gate. The nuns moved to San Felice in Piazza. 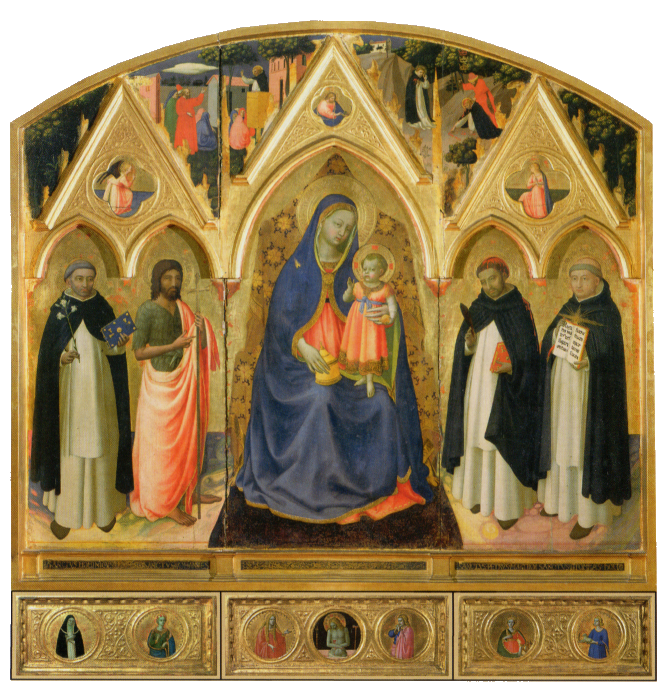 Fra Angelico painted the high altarpiece for the church of the monastery, called the San Pier Martire Altarpiece, in 1428/9, The Virgin and Child with Saints Dominic, John the Baptist, Peter Martyr and Thomas Aquinas (1429) (see right) which is now in the Museum of San Marco. Three predella panels are in the Courtauld Institute in London. They make up seven roundels - the central trio show Christ as the Man of Sorrows flanked by Saint Mary Magdalene and Saint John the Evangelist with flanking pairs of female Dominican saints. There's also a painting by Gherardo di Giovanni del Fora in the Bowdoin College Museum in Maine of Saints Mary Magdelene, Peter Martyr and Catherine of Sienna (c. 1475) that may well, not least because of its choice of saints, have been painted for the convent here. A Romanesque basilica, consecrated in 1068, restored in 1294, and reconsecrated in 1299, which had been used up until the construction of Palazzo Vecchio in 1313 for the City Councils of the Florentine Republic, at which Dante (who lived nearby) and Boccaccio were amongst the speakers. 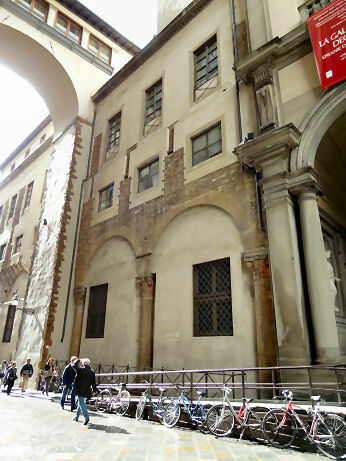 The arches of the left nave, destroyed in 1410 when Via della Ninna was enlarged, are visible from the street (see photo left). 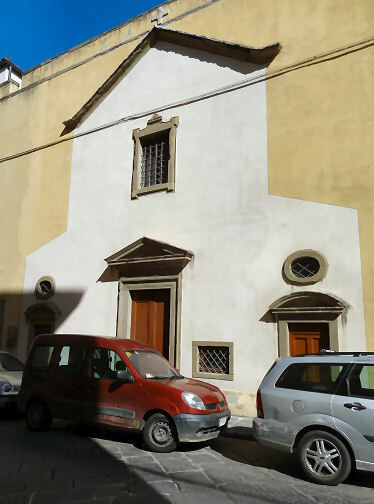 The church takes its name from the schiaraggio, or drain that ran beside the city walls. Giorgio Vasari, when he began work on the Uffizi in 1560, demolished/incorporated the church into the building. 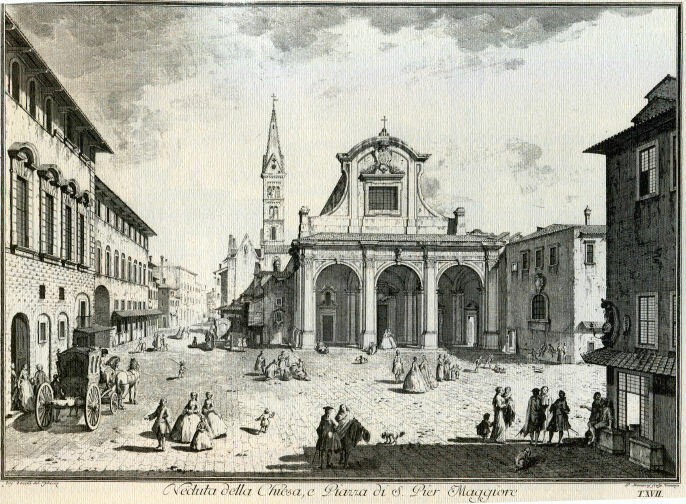 After the confiscation of ecclesiastical properties carried out by the Lorena in 1743, the church was deconsecrated, partially demolished and partially incorporated into the Uffizi 1782. The nave still exists and was restored in 1971 but is not open to the public. The church's hall is used to display detached frescoes, including several from this church and Andrea del Castagno's series of Famous Men from Villa Carducci at Legnaia, (including Danta and Boccaccio) of around 1450. Also fragments of Roman-period decorations of a room that is thought to have been a tavern, discovered under San Pier Scheraggio during the 1971 restoration work. Francesco d’Angelo (1446-1488), also known as Il Cecca, a Florentine sculptor and engineer, best known for his sculptures - often mechanical - carried in religious processions, theatrical machinery, and military devices. He was killed in battle in 1488 while accompanying the Florentine army and was buried here. In his Chronicles Giovanni Villani says that Florence was constructed in the image of early Christian Rome, with the position of its churches reflecting the pilgrimage churches of Rome. He claims that this church stood in for Old Saint Peters. There were once Cimabue frescoes in the nave, it is said. Giovanni dal Ponte's San Piero Scheraggio predella, or around 1430, now in the Uffizi. A late 12th century pulpit, disassembled during the transformations carried out by Vasari in 1570, went to San Leonardo in Arcetri in 1782. Ridolfo Ghirlandaio's Virgin and Child with Saints Julian and Sebastian was transferred from here to San Martino della Scala in the early 19th century. First documented in 1077 and named for the bishop saint of Forlimpopoli . 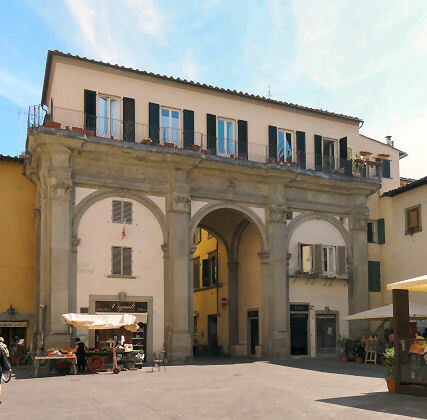 It first faced the small Piazza Cavallari, but in 1620 was reorientated with its entrance on the Piazza dell'Olio. With the suppressions of 1785 it was put to residential use and then demolished in 1823. Pontormo's fresco of a Sacra Conversazione, now in SS Annunziata. Maggiore to the left. From the Buonsignori Map. 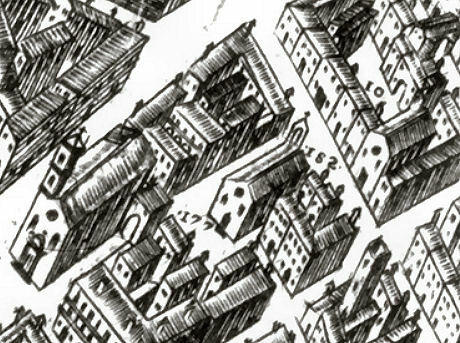 From the 1584 Buonsignori Map. Opposite the Palazzo Vecchio, built in 1341 where there had been a church since the 9th century, although the first documented mention dates to 929. Damaged by the same fire which burned down Orsanmichele, along with the rest of the centre, on June 10, 1304, but swiftly rebuilt. Moved in 1367 to enlarge the piazza. Suppressed in 1783 and later demolished. 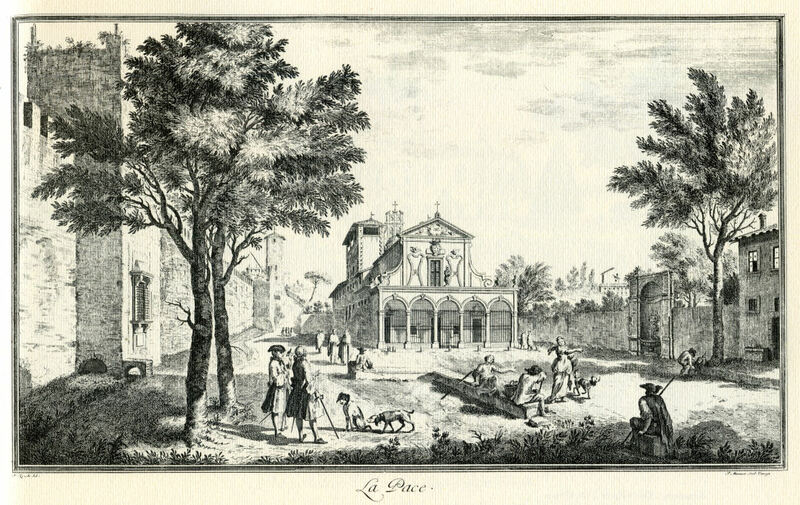 The site of the church is now the Palazzo Lawison(?) The church is remembered in the naming of the small Piazza di Santa Cecilia behind. Saint Cecilia and Eight Stories from her Life by the Saint Cecilia Master (see below). This altar frontal, from the church of Santa Cecilia, is today generally dated shortly after 1304; it is the work of an anonymous master who may have worked with Giotto at Assisi. Vasari thought that it was by Cimabue. It's now in the Uffizi. An altarpiece of 1641 by Francesco Curradi of The Death of St. Cecilia now in Santo Stefano al Ponte. 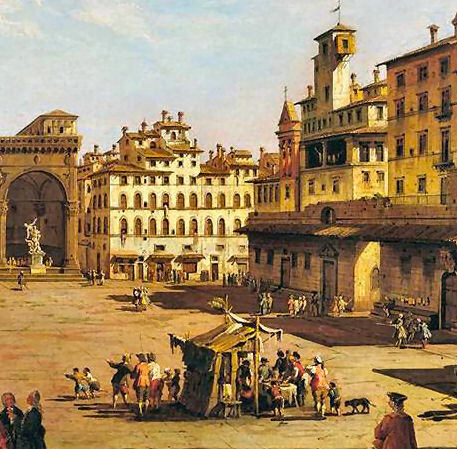 A painting by Giuseppe Zocchi called Piazza della Signoria of c.1741, now in a private collection, shows Santa Celilia to the right (see detail left). I think that it must be the second doorway beyond the archway, under the bell tower. The church was founded in the ninth century and was perhaps best known for its bell, which rang at three in the morning to signal the finish of work in the Old Market. It also famously rang on the night of 11 December 1529, during the siege of Florence, signalling the sortie of the Florentine militia. During construction of Santa Maria del Fiore, the church of Santa Maria degli Ughi functioned as the cathedral. The Ughi were one of the oldest families in Florence and also gave their name to Montughi at Careggi, where they had the country estate. The church was deconsecrated in 1785 and was later used by the Strozzi as a private chapel. It was demolished in the late nineteenth century as part of the demolition of the Old Market area. The Palazzo Mattei stands on the site of the old church. 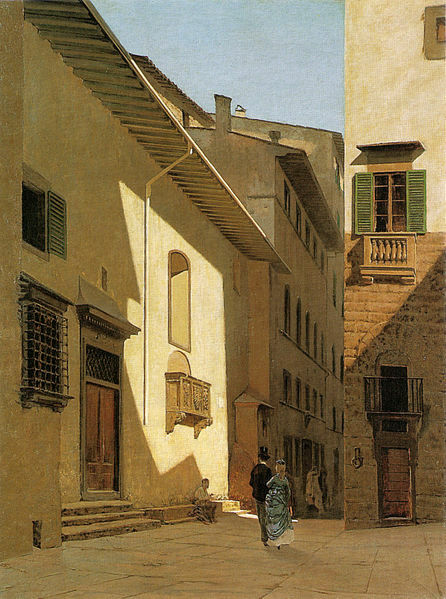 A painting by Fabio Borbottoni (1820-1902) of Piazza delle Cipolle (as the Piazza Strozzi was then called) shows the Strozzi Palace on the left and this church on the right. Built as the Santissima Annunziata alle Murate and Santa Caterina convent from 1439 for the Benedictine nuns who had moved from crumbling cells (murate means 'walled up') on the Rubaconte Bridge, which was where the Ponte alle Grazie is now. A poor woman called Appolonia had first walled herself into a small house on the second pier on the bridge in 1390. She was joined by other women and in 1413 they were pressured into becoming Beandictines and called Le Romite dell'Annunziata. In 1424 there were thirteen women and they moved to a house on this site this site. At first the parish and Benedictine convent of Sant'Ambrogio placed restriction on the size, number of chapels and use of the church here, called Santa Maria della Neve. But in 1434 a papal bull disconnected the convent from the parish and allowed the abbess more autonomy. So there were soon plans to enlarge the convent buildings to accommodate the growing number of nuns, now numbering thirty-six. Work was underway when Giovanni D'Amerigo Benci approached the abbess, Scholastica Rondinelli, with a view to endowing a chapel. Benci, a Medici bank employee, was Cosimo de' Medici's most trusted deputy and, following his return to Florence in 1435, was to become the convent's major early patron. 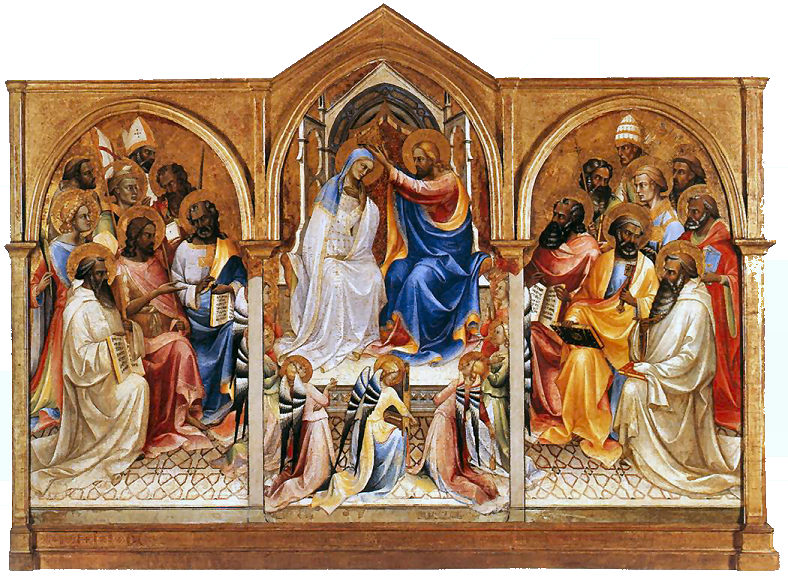 He initially undertook the financing of three altars for the church, with altarpieces by Filippo Lippi, as detailed in Lost art below. In the late 1440s/early 1450s he paid for considerable expansion and rebuilding to house the now exceeding one hundred nuns. His granddaughter Ginevra, the subject of a famous Leonardo portrait, stayed here prior to her unfortunate marriage, and after her death was vested as a nun and buried here. The complex was further renovated and expanded first in 1471, after a fire, and in 1571 following a flood, this latter rebuilding having provided the church with it's most recent façade, traditionally(!) ascribed to Michelangelo. Documents show that Lorenzo de' Medici financed the early 1470s construction work, but coats of arms and such announcing his involvement were consciously avoided. Caterina de'Medici stayed here from 1528 to 1530 when Queen of France and, after the death of Cosimo I in 1574, so did Camilla Martelli, his second wife. Also the illegitimate daughters of Don Pietro de 'Medici. Suppressed by the French in 1808, the convent was rebuilt by the architect Domenico Giraldi in 1845 and turned into a prison after the closing of the nearby Stinche and the Bargello in the mid-1800s, which it remained until 1985. During World War II the prison became notorious for the imprisonment and torture of partisans captured by the fascists. Much damage to the church during the flood of 1966, with prisoners having to be rescued by locals. Following the building of the new lily-shaped Sollicciano prison in the mid-1980s the Murate has been jazzily restored and transformed into housing units, shops, and restaurants, with pedestrian spaces and a piazza named after the chapel of Santa Maria della Neve. The plans were drawn up by Renzo Piano in 1998 and the complex opened in 2011, although some parts remain unfinished. An image of the nursing Madonna was said to have cured a nun's illiteracy when she prayed before it. 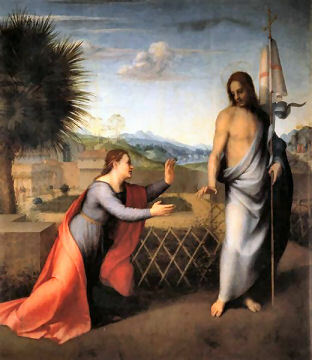 The convent also possessed a similarly miraculous Annunciation in the sacristy, said to have been the painting brought from the church on the Ponte Rubiconte and now lost, and a Crucifixion by Neri di Bicci. 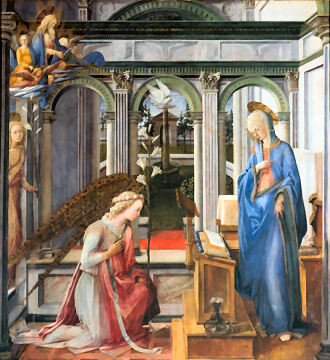 A Filippo Lippi Annunciation (c.1443) (see left) features a young angel in the doorway to the left, said to represent an angel who regularly appeared to the nuns here. It was painted for the high altar in the church, is now in the Alte Pinakothek in Munich. Lippi painted three altarpieces for this church, another was dedicated to Saint Bernard and is reported to have been destroyed in a flood in 1547. However it has been suggested that a very damaged panel in the MET in New York depicting Saints Augustine and Francis, a Bishop Saint, and Saint Benedict might be a surviving fragment from this second altarpiece. Both works by Lippi were financed by Giovanni d’Amerigo Benci, using his boss Cosimo de'Medici's favoured artist. The third was a Crucifixion, now lost. There's a Raphaelesque Madonna and Child by Ridolfo del Ghirlandaio, now to be found in the Sant'Onofrio di Fuligno refectory which was originally in the convent here. The Last Supper by Giorgio Vasari, on five wooden panels, was moved from here to San Marco after suppression, and to the Castellani Chapel in Santa Croce in 1815. In the 1880s it was moved to the former refectory there, after it was decided to make it a museum. It was much damaged during the 1966 flood, having remained submerged for 12 hours, and underwent restoration (funded by the Getty Foundation) from 2010 at the Opificio delle Pietre Dure. It had been put into storage after the flood due to a lack of funds, a situation exposed by Marco Ferri in November 2003. The restoration was completed and the restored painting was returned to the refectory at Santa Croce in 2016. Vasari also made a painting of The Annunciation for the Murate, in payment for his sister's dowry here. He wrote that he had maybe made the Virgin look a bit too terrified. Stood just outside the Porta San Piero Gattolini The church had a 'very beautiful' choir of walnut decorated with intarsia work. Another church that was outside the city walls and was destroyed by German soldiers during the siege of 1530. 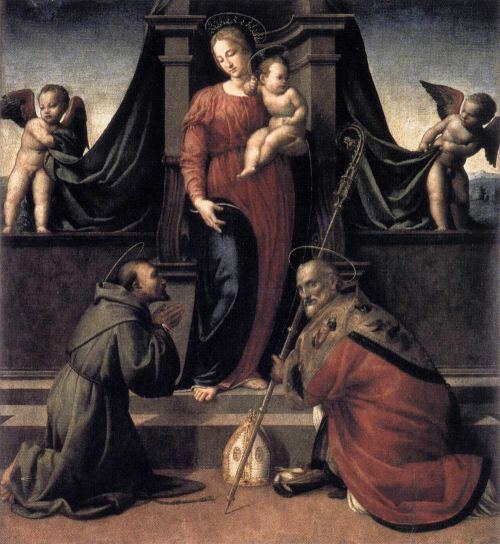 Filippino Lippi's Madonna Appearing to St Bernard of Clairvaux, now in the Badia, was originally painted for the Del Pugliese family chapel here. The Accademia has Rossello di Jacopo Franchi Coronation of the Virgin surrounded by Saints and Angels. The church was built on the site of a chapel destroyed during the siege of 1530. Consecrated in 1573 as Santa Maria della Neve and later dedicated to Santa Maria della Pace. Part of a monastery which passed in 1616 to the monks of St. Bernard of Clairvaux. Later abandoned, and converted to private accommodation in the 19th Century. Demolished with the transfer of the Italian capital from Turin to Florence, when it became necessary to create new royal stables. These stables later became the current Art Institute. Also known as Santa Maria dei Bardi, this church is first documented in 1181. It was rebuilt in 1210, paid for by Bardi family. A plaque on the façade read "Fuccio mi feci" and the date 1229, which had to have been the date of a restructuring, not the building, which misled Vasari. The church was closed on 13 May 1785 and the building, which was side-on to the river, was demolished in 1869 during work on the widening of the embankments. The strange devil-bashing Madonna of Succour (1593) by Jacopo Chimento (Empoli) was in the Barcagali-Perucci chapel here. It's now in the Palatine Gallery in the Palazzo Pitti. 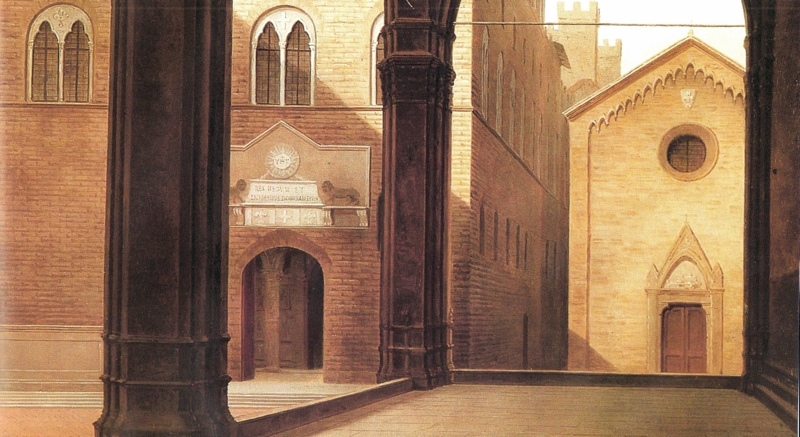 There is a painting of the church by Telemaco Signorini (see left) commissioned by the descendants of the Bardi family and painted shortly before its demolition. The 120th of the stories in the Trecentonovelle (300 stories) by Franco Sacchetti (c.1335-1400). Francesco Brina Adoration of the Magi with one magus looking a bit like Michelangelo, is in the Andrea del Sarto Cenacolo Museum at San Salvi.